At HIRS we are always extra careful about the heath of your children and staff. On its rolls the school has a full time resident nurse to look after the medical needs of the children. 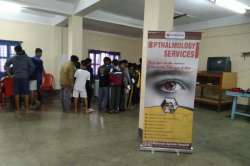 In case of need for doctors consultation the children are taken local hospital or certified MBBS doctors at Siliguri. From time to time the school also arranges for visiting doctors on campus like dentist, eye specialist, skin specialist and general physician.